UNIQUE Future Proof Plates are firestop tools used to plan and prepare for future cable needs in new construction. Another UNIQUE idea. Special Order only. To order, use the Special Order form or call us at 251-960-5018 for quick, accurate Customer Service. Future Proof Plates (FPP’s) are Special Order firestop tools for new construction that allow architects, designers and engineers to plan, centralize, install and maintain firewall penetrations made by cable installers- for the life of a new building. 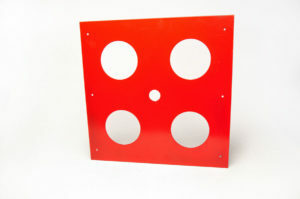 This UNIQUE product is designed to be used as a template for various size sleeves to be installed in the future, only when needed. Do not penetrate the firewall until it is time to do so. FPP’s can be designed with multiple sleeve holes for all the different types of cabling to be installed, smoke sealed and fire stopped. Install the FPP’s on to the firewall by screwing them to the wall studs or anchoring in block walls. FPP’s can be used with any type of mechanical sleeve system on the market today. To order Unique Firestop Caulk click Unique Firestop Caulk. All FPP’s are powder coated RED and made from .068 cold roll steel. They are available in unlimited configurations to group your cable media as well as to ensure consistent AHJ acceptance. Made in our factory in the USA and prices start at under $100..
To order, use the Special Order form or call us at 251-960-5018 for Customer Service. To install a Future Proof Plate (FPP), the installer chooses a spot above the ceiling and between wall studs with easy access and that is devoid of any conduits or wires. Install the FPP by leveling and screwing it (or anchoring it) to the wall studs. Seal the FPP’s with a bead of caulk behind the plate around each of the holes. 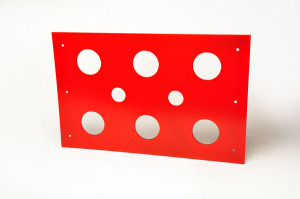 The FPP holes do not need to be drilled out until needed. However, you may wish to install and seal firestop sleeves for future use with End Caps . To install sleeves through the Future Proof Plate, use a drill with a level and short extension for your hole saw. Drill through the installed plate and through the wall on the other side taking care to keep hole bit level and straight. You may now install Sleeve Systems as they are needed.